As we all know, swimming pools are huge investments. From installation to ongoing maintenance, a considerable amount of work and resources go into keeping pools clean and clear year round. It seems a bit silly then that especially in the Northeast, we are only able to use these massive investments for a few months out of the year. That is where modern pool heating technology can come into play though. It might sound like a luxury that you have always thought was out of reach, but pool heaters can be an incredible addition to extend the useful life of a pool well into the cooler fall and even winter months. There are three basic types of pool heaters available on the market today:gas, heat pump, and solar. They are somewhat distinct technologically as well as in pricing and are each beneficial in their own way. Gas powered pool heaters are perhaps the oldest and simplest of the three and function much like a gas powered water heater. They burn either natural gas or propane to heat a series of copper tubes that your pool water is pumped through. This process enables you to quickly raise the temperature in a pool regardless of air temperature or whether or not the sun is out. Unfortunately, because it depends on burning a combustible fuel, it is somewhat inefficient and does contribute to the emission of greenhouse gases. Heat pump pool heaters function somewhat like a gas powered heater in that they pump the pool water through a heating element in order to heat the entire pool. The difference lies in the fact the heat pumps use electricity to power a compressor that generates hot gasses that are then passed through a condenser over which the pool water flows. Heat pump heaters are more energy efficient because of their use of electricity but they do take longer to heat an entire body of water than a gas-powered heater does and the upfront cost of equipment and installation can often be greater. They also depend on warm air temperatures to function most effectively so while they will definitely extend a swimming season past the summer months, they might not be effective into the coldest parts of the season. Solar pool heaters can be the most cost effective and energy efficient option on the market today. They work by pumping the pool water through a series of black pipes that are heated by the sun’s rays. The tubes can be mounted almost anywhere there is full sun like on your home’s roof or even on the ground. This method obviously depends on warm sunny days to function properly so it may only fractionally extend a swimming season. If you are looking for a low-cost, environmentally responsible option though, solar might be for you. There are still a few ways that you can help keep your pool water warm without a heater though. If you are planning a new pool build, consider installing an in-floor circulation system (like adding a ceiling fan to a high-ceiling room). Also, try putting as much of it in full sun as possible and on existing pools, remember to keep up on trimming any overhanging shade plants. It is also always a good idea to include wind blocks like hedges or retaining walls into a poolside landscaping design to keep out cool breezes that can bring your water temperatures down. 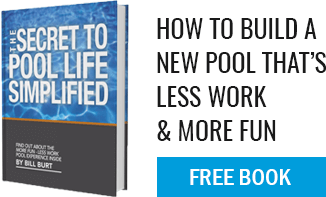 After all of the time and energy that go into pool maintenance, anything that can keep it open and operating longer will give you and your family a better return on your investment and more opportunities for poolside fun.